Lembicz M., Górzyn´ska K., Olejniczak P., Leuchtmann A. (2011) Geographical distribution and effects of choke disease caused by Epichloë typhina in populations of the grass Puccinellia distans in Poland. Choke disease caused by E. typhina was found in 5 out of 24 studied populations of the nonagricultural, Euro-Siberian grass Puccinellia distans. The infected populations occurred in man-made habitats and were affected by salty waste from the nearby Soda Producing Plant. The incidence of fungal infection ranged from 24.4 % to 91.2 % of the plants. A three-year field experiment showed that choke disease significantly reduced the number of reproductive tillers of P. distans during the three years of their life. Moreover, the length of tillers and size of seeds of these individuals were significantly smaller in comparison to the individuals without choke disease. Fungal stromata appeared twice a year – in spring and late summer – and the number of stroma-bearing tillers increased with the tussock age in both periods. The late summer stromata were always white and did not produce perithecia. 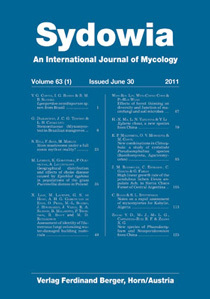 Hence, the additional stromata of E. typhina in late summer did not provide any benefit to the fungus. Their presence might be an indication that the association of E. typhina with P. distans in man-made habitats is relatively new on an evolutionary scale and might be subject in the future to modification by natural selection. Keywords: fungal infection, wild grass, reproductive tillers, size of seeds, phylogenetic analysis.